U.S. 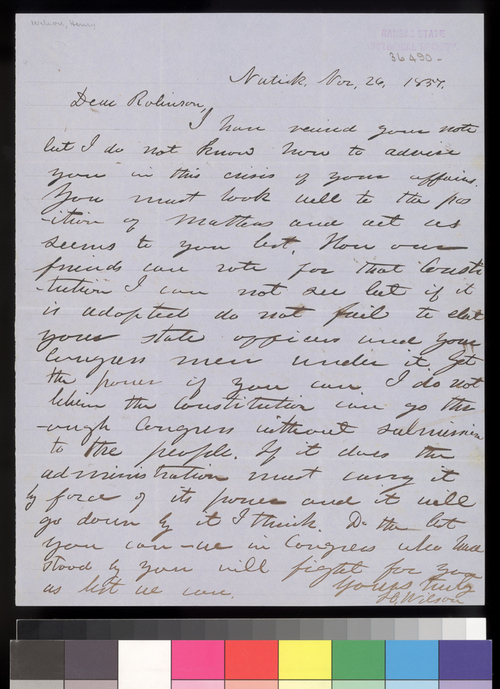 Senator Henry Wilson (1812-1875), a Republican from Massachusetts who was to become vice president of the United States in 1873, writes Robinson from his home in Natick, Massachusetts, regarding the Lecompton constitution controversy in the Kansas Territory. Robinson apparently had written for "advise" and Wilson simply writes "you must look well to the position of matters and act as seems to you best." Wilson did not believe it could pass the Congress, "but if it is adopted do not fail to elect your state officers under it. Get the power if you can. . . ."